One of the great things about virtual reality is the ability to experience places that are either impossible or incredibly difficult to get to. 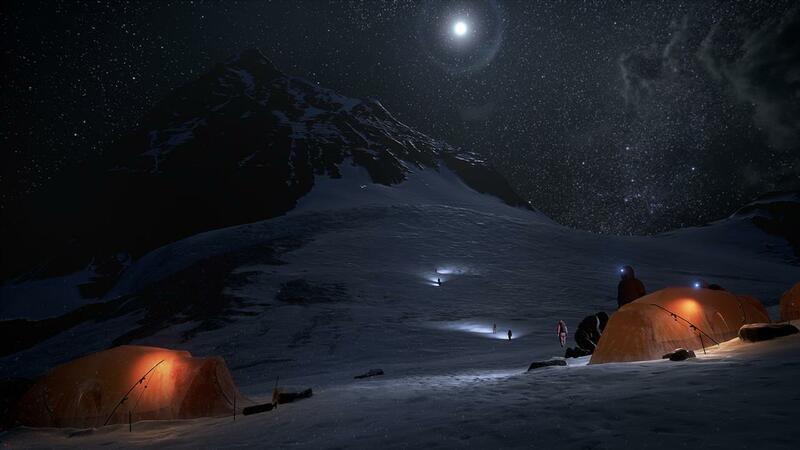 Everest VR is one of those things that wouldn’t be possible without a virtual reality headset. The development team took over 300,000 high quality pictures, created a 3D mesh, and simulated certain parts of the climb to one of the highest points on Earth (Chimborazo in Ecuador is the highest point from the center of the Earth). 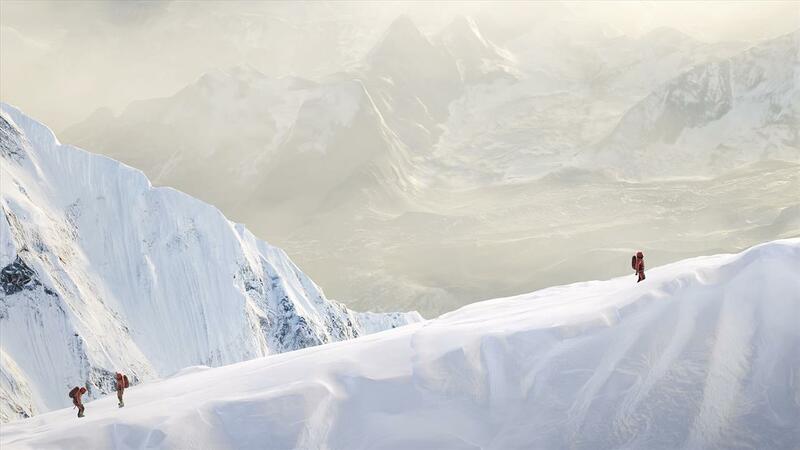 Everest VR uses the Unreal Engine with great success in producing a very high quality experience. The graphics are truly amazing and at many times you felt like you were on the side of the mountain. The quality of the textures really makes for an immersive experience. I would compare it to the Lab’s scenes feature where you can look around a photogrammetry demos, but with a few more things you can do. 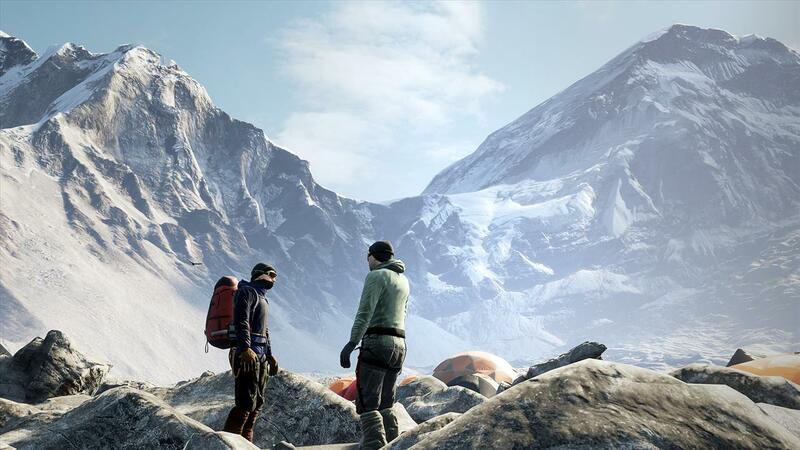 If you were impressed with how scenes like Vesper Peak looked, Everest VR has that and more from a visual standpoint. There are five areas and each starts with a flyby of the locations. You’re flying high above and can look all around you. Let me say there were many times I had a little sense of vertigo just looking around because I was so high up. It wasn’t anything that was uncomfortable, but other people’s reactions may be more intense than mine. I actually enjoyed it. After the narrated flyby, you’re placed on the ground and given a small task. It could be as simple as placing an offering on a shrine to walking across a ladder that’s placed between two ledges. If you’ve ever seen an Everest documentary or a movie, you know how nerve wracking it can be when the only thing between you and a fall to the death is a metal ladder and some ropes. 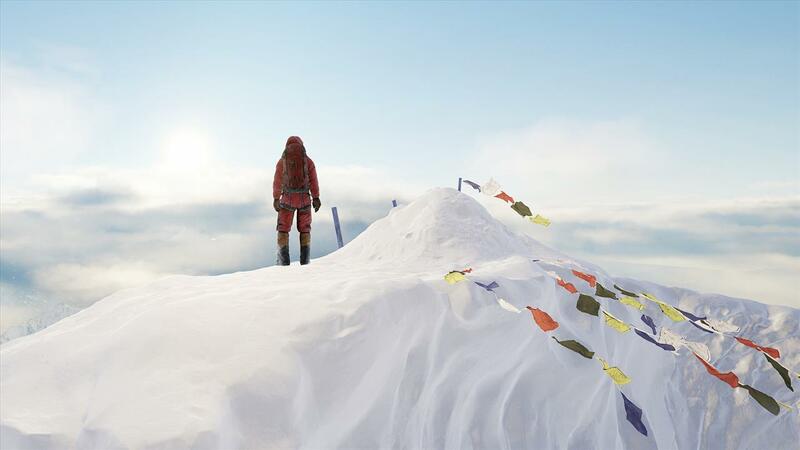 It’s here that Everest VR truly shines as you get to experience first hand what it could be like to climb various parts of Mount Everest. The Vive controllers look like heavy duty winter gloves and allows you to interact with various parts of the environment. Use your hands to climb up the ladder or pick up some of your climbing equipment. The experience supports room scale and you are asked to stand at a starting point before each part begins. If your room isn’t big enough to do some of the walking around, you also have the option to teleport to a location, something that’s inherent in a lot of HTC Vive games. To help bring about the illusion that you’re on a snow covered mountain, those with NVIDIA cards can get some improved snow effects that are physics driven. You can see in the video below what the differences is and it truly does make it a lot more immersive. I have a GeForce GTX 980 card in my machine, which let me played through it in normal. The snow effect, powered by NVIDIA’s Turbulence technology, looks incredibly well done. I was able to hold my glove up as the snow was flying by and see it swirl around or bounce off of it. Another cool NVIDIA technology utilized by Everest VR is Multi-Res shading, which helps performance by rendering the picture at the center of your eye in higher fidelity than those in the periphery. This is one of the reasons you can get such a high quality image while using a VR HMD and get very good performance out of it. NVIDIA recommends the GTX 970, GTX 980, and GTX 1060 to be the cards used for normal while those with a GTX 1070 and a GTX 1080 can experience Everest VR at the highest details possible. With my i7-6600K computer running a GeForce GTX 980 set at normal, I experienced zero performance issues through my half hour in the experience. The entire experience is short though, lasting about 30 minutes. You really shouldn’t rush through the five scenarios and like another HTC Vive experience, theBlu, take your time and look around. The development team did a tremendous job at providing a high quality experience and it’s something you really want to soak in. You can be tempted to hurry up across the ladder bridge or scuttle quickly on the ledge, but you’ll definitely get a better experience if you take your time and look around as you are going through each stage. That said, there seems to be a few missed opportunities with Everest VR. At the beginning while you are sitting at base camp, you see some equipment that you can pick up and one of them is an ax. You can bang it around the environment and push some objects around with it, but it’s never used in any of the five stages, which is a tad disappointing. Also, unlike say Portal where you’re given a small task to get you acclimated at each level with how things work and then thrown into a level where you get to utilized all that you’ve learned in the past, the end of Everest VR just has you teleporting (or walking if you have the room) to the peak to place down a flag. It’s pretty anti-climactic and I would have seen a stage where you experience all or most of what you learned in the previous one into one final climb to the top. The experience is rather short and most of the time is spent viewing a narrated 360 video of the stage. I say you probably spend about 25% of the time interacting with the environment. Also, the price for Everest VR seems to be a bit on the high side for something like this. $24.99 ($22.49 at the time of this writing) is a little too expensive, I think, for a short VR experience with little interaction. The production values are top notch though and it does have some of the best visuals I’ve seen in a VR experience, but the amount of time actually doing something is rather limited for what you pay for.